What? Guided-inquiry worksheets for small groups in recitation section of intro algebra-based physics. Instructors engage groups in Socratic dialogue. Tutorials refine students' productive intuitions and develop metacognitive thinking. Includes resources to help instructors modify tutorials and train TAs. Why? 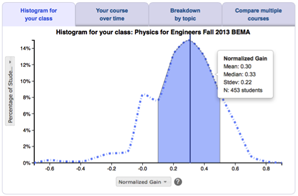 Designed to supplement lecture for algebra-based physics courses. Focus on building students' productive resources rather than confronting misconceptions. Can be adapted to your environment. Includes interactive lecture demonstrations, test questions, instructor's guides, and TA training workshops. Why not? These tutorials are designed for algebra-based physics courses, and may not work as well with other populations. The research base is not as strong as for Tutorials in Introductory Physics. Intro Article: R. Scherr and A. Elby, Enabling Informed Adaptation of Reformed Instructional Materials, presented at the Physics Education Research Conference 2006, Syracuse, New York, 2006. Email Rachel Scherr at rescherr@gmail.com to get the password to download the full set of tutorials, tutorial homework, accompanying interactive lecture demonstrations, test questions, instructor's guides, and materials for TA training workshops. You can download a sample tutorial from PhysPort. T. Smith and M. Wittmann, Comparing three methods for teaching Newton’s third law, Phys. Rev. ST Phys. Educ. Res. 3 (2), 020105 (2007).